Four inches of snow covered everything, like a layer of sugar dusting. It was wonderful, light and frothy, not wet, unpleasant and uncomfortable, like everyone said it’d be. At least it wasn’t yet. The street was still, and impossibly silent with just a hint of movement at the peripheries of my vision: a car door closing, a cyclist in the distance, a dog barking; the only consistent movement was the still gently falling snow. Certainly not a hint of the masses the city has been a home to for centuries. It was hard to imagine that the busy metro was just a short walk away. This part of Berlin, Prenzlauer Berg, didn’t feel like a city. Here, you can stand on the center of the street without having to worry about traffic, though the traffic lights, irritatingly, work exactly as they did in other parts of the city. The buildings seemed old and alike, painted with the same color palette, running from ochre to cream and branching out into other pastels, the same sort of wrought iron balconies, long, regular rows of windows, and ornate doors. 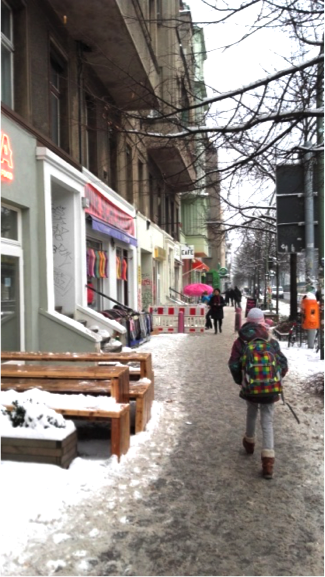 In another part of Prenzlauer Berg, life passed by in droves; the streets sometimes busy and sometimes almost empty. Scooters, bikes, sleds and other modest forms of transport prevailed. Groups of children passed by, wrapped up like burritos in brightly colored parkas. One straggled behind the rest of her large family, diligently transporting an armload of snow that was beginning to crumble, leaving a trail of broken off chunks behind her. Adults strolled by with quicker steps and soberer wardrobes. Dogs were abundant, all pure-bred, well groomed, and on long leashes, creating the occasional stain on the otherwise pristine snow. Breath was visible, eddying in the air. Berlin is a city of eccentrics and artists. 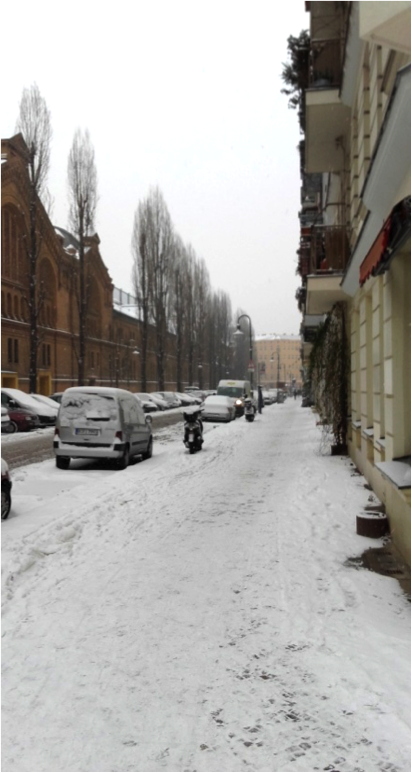 Prenzlauer Berg had its share of both. Indeed, I later found out it was known as one of the city’s Bohemian Quarters. There was, for instance, a balcony encrusted with eerie garden gnomes and other kitsch porcelain figures, all ensconced in a bed of ivy. There was also a bare tree, labeled ‘Love Grows Here’ in English, adorned with wind chimes, many of those strips of colored plastic that spiral in the wind, and strings of seashells, a dreamlike sight when surrounded by snow. 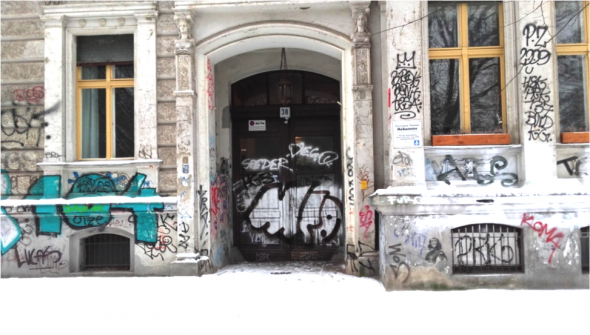 The graffiti, of course, was everywhere, neon and pastel, splattered across ornate antique doorways, the seal of the present marked on evocations of the past. Birds clustered around a bush, piercing the silence with their high-pitched babble. As I came closer to investigate I realized that the bush was hung with bird feeders. Sensing my approach they rose in a flurry of wings to the higher window sills of a building. I felt somewhat guilty for disturbing their meal. Berlin the metropolis, was evident in Prenzlauer Berg, in its many cafes and restaurants catering to many different international tastes; from the ever-popular hummus and shawarma of the Middle East to Mexican, Vietnamese and, of course, German cuisine. The interiors of the small restaurants, where people could unwrap a few layers of insulation, were cozy and warm. The smell of and consumption of food enhances this feeling, making going back outside a harsh surprise, as it seems colder than it did before. The idea of a long sip of a mug of steaming coffee, held between cold fingers, seems enticing. Watched through a café window, the snow could be enjoyed without its unwelcome chill. I was sad to leave, though the darkness was beginning to fall, prematurely from my perspective, and my cold fingertips and tired feet screamed at me that it was time to go. As I was being shaken around by the movement of the train I wondered when and if I would see snow that beautiful again and how long it would be before the day’s snowfall became filthy and unpleasant, as it inevitably would.